On holiday in the Greek island of Kos last year we had the most delicious dessert, recommended by the waiter. We asked him what it was called, and I wrote down ‘Galactic-Bore-Echo – make this’ in my phone. With the help of Google we were able to translate that into the real name of the dessert: galaktoboureko. As Wikipedia explains, Galaktoboureko is a Greek dessert of semolina-based custard with filo pastry layered on top and underneath, coated with a sweet syrup. As luck would have it, one of our Greek cook books has the recipe for it: Vefa’s Kitchen p587. I started by clarifying about 125g of butter. I heated it until it just about to boil, then took off the heat and transferred to a bowl. After cooling a little I skimmed of the milk solids to leave the clarified butter. Then I scalded the milk: put in a large pan and heated until it started to give off a vapour, then took of the heat and transferred to a bowl. While the milk cooled I whisked the eggs, yolks and sugar, then whisked in the semolina. This then went in the (cooled and cleaned) large pan, and the warm milk was gradually whisked in. This was then brought to a boil and simmered for 10 minutes, stirring all the time, until it thickened nicely. 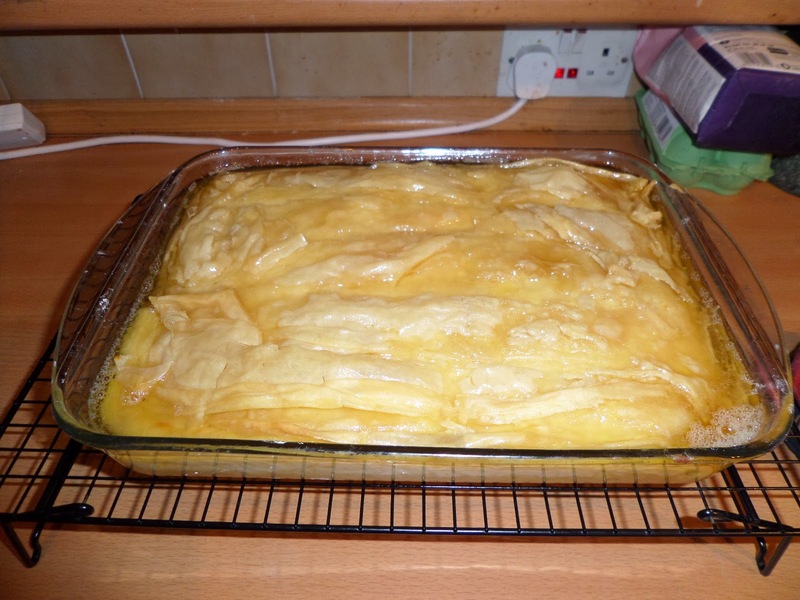 Anyway: I used 3 sheets of filo, each halved, and lined the bottom of a 23cm x 30cm Pyrex dish. Between each layer I brushed with the clarified butter. I then used the remaining 2 sheets of filo (plus some scraps I recovered from the tea towel…) to make the top. I made it on the bench ready to transfer,, and cut 4 long slits in it (which I assume it to allow the custard to breathe while cooking, and let the syrup in after cooking). The custard gets poured over the filo base, then the filo top is placed on top, and is sprinkled with warm water. Then it’s into a 170c fan oven for 15 minutes, then down to 140c fan for another 25 minutes, until the top filo crisps up (mine didn’t have much colour, but was just crispy, and the custard was still wobbling inside). The sugar, water and lemon jiuce is brought to the boil on the hob, during which time the sugar dissolves. It’s then left to boil, without being stirred, for 7 minutes. It’s then off the heat, and once it stops boiling the vanilla is stirred in. When the custard comes out of the oven, the syrup is then poured over the top, then it’s all left to cool and set on a wire rack. To serve: cut into pieces and eat! However… to paraphrase The Hitchhiker’s Guide to the Galaxy: it was almost, but not quite, entirely unlike the dessert we had on holiday!